StartSSL provides free SSL/TLS certificates for web servers, and it also installs a Class 1 Client certificate into your browser to authenticate yourself to its own site. This article is all about how to install the Class 1 Client certificate into Google Chrome, especially when Chrome does not accept the certificate automatically, as happened to me when an old certificate expired. I'll be signing up under the dummy address website@nick-andrew.net to demonstrate the process. Click on "Send Verification Code"
Enter the supplied code into "Verification Code", then click "Sign Up"
At this point, Chrome is supposed to import your client certificate and you can be on your way. Certainly at this point if I was using Firefox, then Firefox has installed the certificate, and a box appears with a "Login Now" button. But it doesn't happen for me, on Chrome version 50. So I'm going to set it up the hard way. Make sure you enter website@nick-andrew.net in the Common Name field. Select "Client S/MIME and Authentication Certificate"
Finally, you can import the certificate.pkcs12 file into Google Chrome. Go to chrome://settings and click on "Show advanced settings". 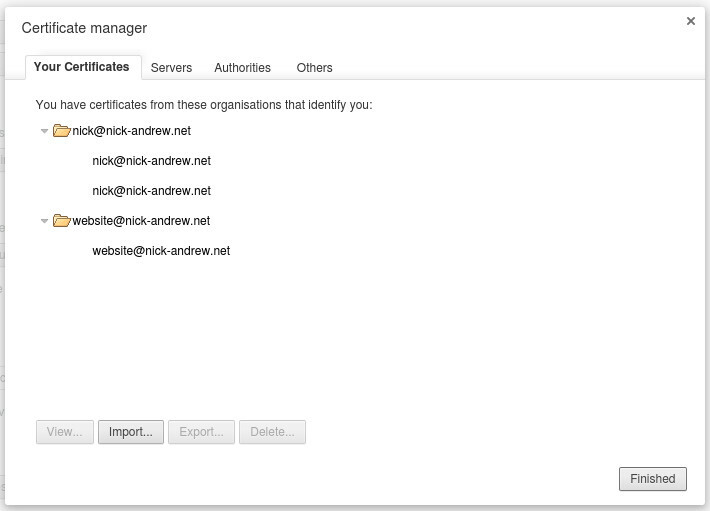 Then click on "Manage certificates..."
In the "Your Certificates" tab, select "Import..."
Select "certificate.pkcs12" and enter the Export password you used. At this point, Google Chrome has successfully imported the certificate, and it can be used to authenticate to StartSSL the next time you visit the site. Writing objects: 100% (8/8), 1.00 KiB | 0 bytes/s, done. remote:        ! Configuring . failed. See /home/ubuntu/.cpanm/work/1412583687.168/build.log for details. remote: Using release configuration from last framework (Perl/PSGI). This looks very nice. At this point, 2 tsuru apps should be ready to run, at the hostnames shown, which both resolve to 192.168.50.4, the address of my cluster. Flynn is a new PaaS (Platform as a Service) project intended to manage a cluster of servers running applications inside containers. Applications are deployed using a simple 'git push' and behind the scenes the application is built in a container and the container is then started on one or more nodes within the cluster. Current version is v20140817, classed as Pre-release. In other words, it's still bleeding edge. I tried it out under a VMWare ESXi client, an LXC container and inside a Vagrant Virtualbox VM (all running Ubuntu 14.04 Trusty). First, the two failures. Trying it in the LXC container failed utterly because the container wasn't able to itself run containers. I could have probably fixed that by messing with the LXC container configuration, but there are only so many hours in a day (and I use all of them already). I couldn't get Flynn running under the ESXi client. I doubt it was an unfixable problem, i.e. there's nothing inherent in the ESXi client which would stop Flynn from working. Don't forget to install the correct linux-image-extra package, as I did - else you won't have aufs and Flynn will emit unhelpful errors. Don't forget to run the flynn-release command, as I did - else flynn-host will not be able to run anything and it will respawn forever by upstart. In fact it's a good idea to change the respawn limit 1000 60 line to respawn limit 5 300 and add a line post-stop exec sleep 10 to ensure that if Flynn doesn't start up properly, it won't thrash your VM. After this it's necessary to run flynn-bootstrap, and that must be done after setting up some wildcard DNS resources to point to your cluster host(s). Flynn's load-balancing (?) router uses the hostname in the HTTP request to distribute your traffic to the apps running in the containers listening on some ports other than 80 or 443. When I did eventually get Flynn running, it more or less did what the sparse documentation indicated it should. I was able to get a simple perl web app running in containers. An app is developed in a git repository and is deployed by pushing a branch to Flynn's git server. Flynn then builds the app into a container and deploys it accordingly. Building the app requires some machine-readable build and execution instructions. Documentation for doing this for perl was nonexistent so I had to figure it out. Here's my application in its repository. Did I mention there is no documentation for running a perl app? Flynn apps can (must?) be defined in a Heroku buildpack compatible manner. The included flynn/slugbuilder component has some preset buildpacks, and one of the buildpacks allows additional buildpacks (such as the perl one) to be specified in a .buildpacks file. So that's what .buildpacks is for, to pull in Miyagawa's buildpack for a Perl/PSGI application. The cpanfile says what perl modules need to be installed. I used Mojolicious and generated a sample application with a very small amount of customisation. For Miyagawa's buildpack, the perl script has to be named app.psgi (that's how it detects if the buildpack should be used). Finally the Procfile is a YAML file and it specifies how the command should be started to run in 'web' (flynn scale web=5 scales the application to 5 concurrent instances). I could have omitted the Procfile, and Flynn would have started the application according to instructions in a .release file generated by the buildpack. That's how far I got before something broke and I couldn't get Flynn working again. Bear in mind, Flynn is still bleeding edge but it shows some promise. Flynn's still beta but the system shows promise. The company has a lot of sponsors and a good theoretical base ("service discovery inspired by the Google Omega paper"). More documentation is needed, indeed the lack of explanation for running a perl app inspired this blog post. I was looking for something with a simple interface and Flynn was the first thing I tried. I just wanted to (a) be able to push my repo to have it deployed, and (b) not have to care where it's actually running. Flynn satisfied those two requirements. Flynn's error messages are painfully inadequate. "driver not supported" means the aufs kernel module couldn't be loaded. Other messages were even less useful. Flynn writes heaps of logs under /tmp/flynn-host-logs and, while they helped in debugging a little, I wonder if they'll ever be cleaned up. I couldn't run Flynn in production with such a profusion of log files growing forever. Docker images seem a bit fragile. Running the flynn-release command broke because a docker image was partly downloaded and I had to clear it myself out of the /var/lib/docker directory before Flynn could download the rest of its code. Next up I'll be testing Tsuru. Then sound worked. I assume that pulseaudio couldn't get the ALSA device information due to the problems with the config file(s). It was probably only .asoundrc.asoundconf with a problem but I had nothing special in the other file so I removed that too. Grub 2 (versions 1.96 and later) can boot disks which use GPT, but there are some considerations which are detailed below. What's the MSDOS partition table? The MSDOS partition table was invented when disk drive capacities were around 5-20 megabytes and sectors were addressed using a (C,H,S) 3-tuple: Cylinder, Head and Sector numbers. This addressing scheme has been obsolete for a very long time now, and has been kludged several times to cope. Firstly disk drive capacities increased enormously - and we started to use geometries with large numbers of heads (63) and sectors (255) to cope. Secondly disk drives no longer have a fixed geometry: although the number of heads is fixed (up to twice the number of physical platters the drive has), there is a varying number of sectors per track, as more data is stored on the outside of each platter. Disk drives store an approximately constant amount of data per square millimetre of disk surface. Thirdly, modern drives provide internal error correction by relocating sectors away from disk areas with physical defects. The MSDOS partition table uses CHS and also provides an LBA representation of each partition. LBA is a linear numbering of sectors independent of the physical drive geometry in which sectors are numbered starting from zero and going to a very high number (depending on device listed capacity) and we have relied on this for some years now - as the size of devices exceeded the capacity of CHS to describe, operating systems started ignoring the CHS values and using only LBA. But LBA's capacity is about to run out; it has a hard limit of 2 TB (1 terabyte = 2^40 bytes) and we will soon surpass that capacity. GPT uses an LBA system with a much larger capacity. It has provision for more partitions per device (although in my experience, with larger device sizes we make larger partitions, not more partitions). MSDOS was limited to 4 so-called "primary" partitions and one of these could be used as a pointer to further "extended" partitions. It was a kludge, and GPT eliminates this kludge. MSDOS also used a single byte to describe the contents of each partition. This was troublesome as almost all of the 256 possibilities have been used at various times (the linux fdisk utility contains a list). So GPT extends that with UUID based partition types - an almost limitless set. Linux supports GPT partition tables (also called disk labels). A tool called 'gdisk' can create and edit them, and other partitioning tools have varying levels of support. Grub 2 can boot disks partitioned with GPT. But there are some interactions between Grub, GPT and RAID, which is the reason for the existence of this article. GPT partitions can be made with 'gdisk'. Some of the tools are still immature. Grub2 can boot GPT partitioned disks, but it needs a so-called "BIOS Boot Partition" of at least 32 Mbytes. That's where Grub2 stores some of its low level boot code. Grub2 cannot boot off a RAID partition which uses version 1.0, 1.1 or 1.2 metadata. The RAID must have been created using version 0.90 metadata. Storage manufacturers are now shipping 4K sector disks. Why 4K not the previous standard of 512 bytes? 4K sectors are more efficient for such large devices: the drive can pick up more data with each read operation; the number of physical sectors on the device is reduced by 8 times (which reduces the size of relocation tables, for instance); 4K matches the page size used in the x86 architecture. There are a lot of good reasons why. The first Western Digital 4K drives were released with a compatibility mode enabled in which the drive simulates 512 byte sectors. This can affect performance quite a lot. The installer should ensure that all partitions are a multiple of 8 sectors in size. This affects GPT partitioning as well as MSDOS. It's a bit easier to ensure this in GPT because there's no geometry baggage, unlike MSDOS. The LS-30 can notify an alert via its internal PSTN interface. 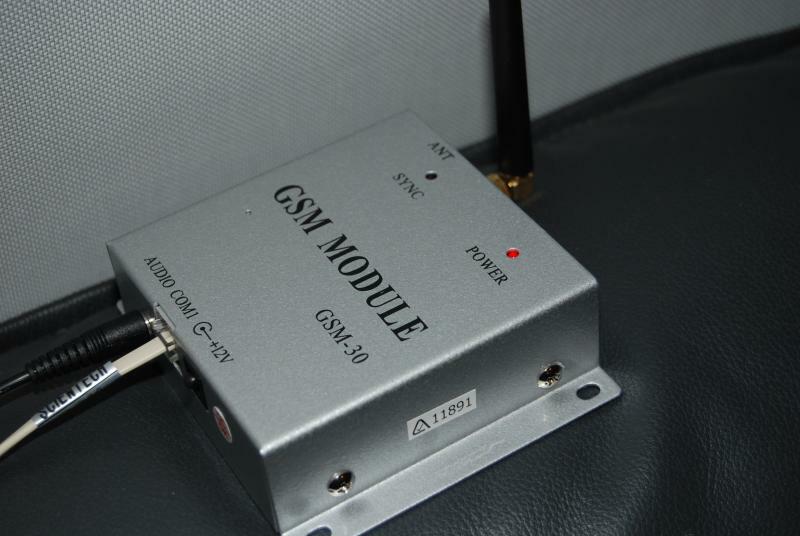 There is also an optional GSM interface (pictured), which takes a SIM card and can be used instead of or in addition to the PSTN notification. The "01-03" refers to the device which triggered. My monitoring software can detect a Burglary message and SMS me directly. I get the impression that it takes a couple of minutes for the LS-30 to get around to sending an SMS. It may be that the LS-30 takes time to check the PSTN line for a dial tone. The LS-30 seems to try to alert via PSTN first, and tries GSM second. The zone and group numbers would correspond (on a real burglary) to the "01-03" shown above. 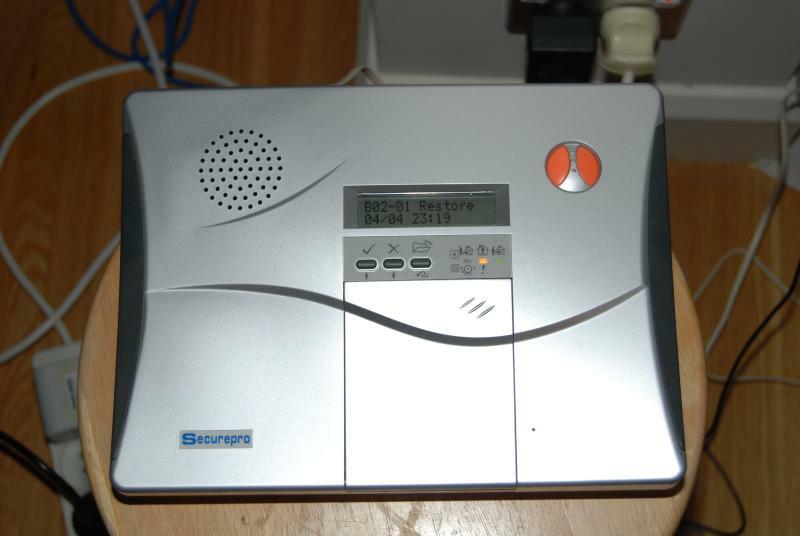 In February 2010, after long investigation, I purchased an LS-30 Alarm System From Securepro Security. Having moved recently, I needed an alarm system. I'd had many years experience with the Solution 16 (PDF) range of alarms, originally designed and manufactured by EDM (a Zeta Internet customer) and now owned by Bosch. But I thought perhaps technology has improved in the meantime, and I wanted something more powerful, configurable, ... more geeky. That's the LS-30. It is very configurable, and according to the vendor has "more features than any other system available". Except perhaps for very expensive commercial systems. What appealed to me though, was the ethernet interface - I can plug it into my network and (hopefully) configure it remotely. I have begun to reverse-engineer the LS-30 communications protocol. Furthermore, I have released my code under the GNU General Public License (Version 3) so others in the community can benefit from this effort (and help me finish the job). See the links in the left column to my GitHub project. I was able to solve the problem with dnscache. Basically, before sending each new request to a nameserver (for a particular query), dnscache would close the socket used for the last request. So any late response would not reach dnscache. The improvement on performance is extreme. I'm testing on a virtual machine using the 'netem' module to artificially create network latency of 5000ms. Before patching, dnscache took 310 seconds to lookup 'A www.telstra.net' - much longer than I had calculated in the previous post, because in fact dnscache had to send more requests than expected due to missing nameserver glue, perhaps for the net domain. After patching, dnscache was able to resolve 'www.telstra.net' in only 16 seconds. It sends 6 queries then receives the response to the first, and closes the socket so subsequent responses are ignored (they're not needed anyway). You might think this patch is not necessary because 5000ms network latency is an extreme test and most internet hosts will have much lower latency (it's usually a leaf-node problem) but I experienced it on a modern HSDPA network. Also I have seen saturated dialup and ISDN connections with very high latencies (over 3000ms for ISDN). Also dnscache's timeouts start at 1 second so performance will start to degrade as soon as average request latency exceeds 1000ms. The more nameservers a domain has, the longer it will take to lookup because dnscache sends a request to every nameserver with a 1-second timeout before changing to 3 seconds (then 11, then 45). This repository also contains all public releases of djbdns to date: version 1.01 through 1.05. DJB has put djbdns into the public domain so it is OK for me to do this. There are also some patches written by other people, linked from tinydns.org. Feel free to clone, fork and submit further patches to this djbdns repository on github. Like most people I use dnscache extensively for name resolution within my network. All this worked fine until recently when my DSL link broke (with the telephone line) and I had to use HSDPA for external connectivity. My HSDPA provider is supposed to provide a maximum speed of at least 1.8 Mbit/sec - of course this can be lower due to network congestion, poor signal strength, low capacity network links and so on. I don't think I have ever received the full 1800 kbit/sec from my provider, maybe nothing over 300 kbit/sec in fact. Anyway this particular outage was particularly troublesome because I was getting only 50 kbit/sec through HSDPA ... slower than a dialup modem. It was slow in another respect too, the packet round-trip time was between 5 and 7 seconds. That's over 200 times more than a typical RTT on DSL of 25 ms. I don't know what caused the extremely high latency, but I do know what its effect was. Dnscache failed almost completely. It would send out requests to nameservers on the internet, and not receiving any response in a reasonable time, would go on to try the next nameserver, and the next, and so on. The responses came back at some later time ... after dnscache had given up on the request (and dnscache would ignore the response). So the net effect was a storm of DNS packets sent and received, as well as ICMP port-unreachable packets when responses were received after dnscache had stopped listening. Now that the DSL is working I am testing dnscache (from djbdns 1.05) to see the exact nature of this problem and if it can be fixed. I am using Linux's Traffic Control subsystem (see lartc.org for documentation) and specifically the 'netem' queue discipline module to simulate various amounts of latency to a virtual host. This script is run on my gateway and it uses the HTB queue discipline on device eth0 and some classes beneath that to filter outbound packets on that interface. Packets sent to 192.168.1.75 are delayed (by the 'netem' qdisc) by exactly 5000 msec, which is more than enough time to give dnscache a headache. query 1 7f000001:e4d2:6114 1 telstra.net. What seems to be happening here is that dnscache is looking up the root nameservers ('.') for 'telstra.net'. The hex numbers are the IPv4 addresses of each root nameserver. Dnscache tries them in order (at least, in the same order as they appear on the 'tx' line). There are 13 root nameservers and these requests appear to be issued once per second - so this process has taken 13 seconds so far. With a 5000 msec delay on the interface, 8 of those 13 requests have been replied-to, but dnscache apparently stops listening for a response as soon as its timeout expires (1 second here) and it sends the next request. rr 803f0235 172800 ns net. a.gtld-servers.net. rr 803f0235 172800 ns net. b.gtld-servers.net. rr 803f0235 172800 ns net. c.gtld-servers.net. rr 803f0235 172800 ns net. d.gtld-servers.net. rr 803f0235 172800 ns net. e.gtld-servers.net. rr 803f0235 172800 ns net. f.gtld-servers.net. rr 803f0235 172800 ns net. g.gtld-servers.net. rr 803f0235 172800 ns net. h.gtld-servers.net. rr 803f0235 172800 ns net. i.gtld-servers.net. rr 803f0235 172800 ns net. j.gtld-servers.net. rr 803f0235 172800 ns net. k.gtld-servers.net. rr 803f0235 172800 ns net. l.gtld-servers.net. rr 803f0235 172800 ns net. m.gtld-servers.net. Dnscache has finally increased its timeout to 11 and after another 5 seconds (total time elapsed now 57 seconds) it receives a response. 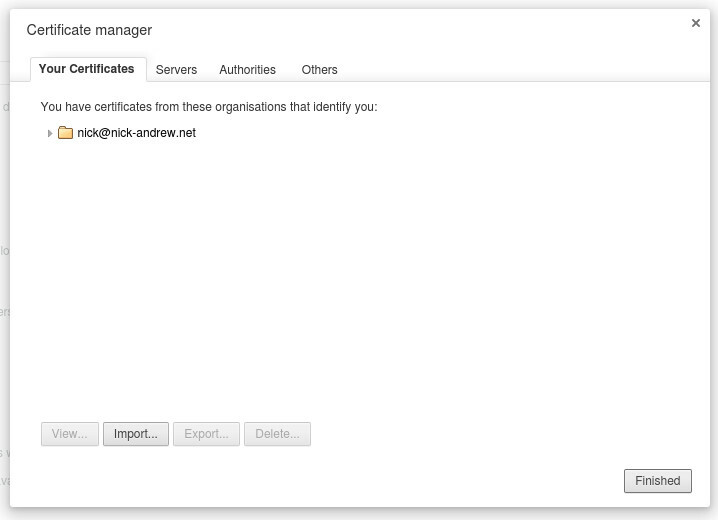 Now it knows the nameservers for the 'net' top-level domain. There are 13 of them and so it's going to take another 57 seconds before it learns the 4 nameservers for 'telstra.net', and then another 21 seconds to learn that there is actually no 'A' record for 'telstra.net'. That's 135 seconds total time. I don't know how long clients typically wait for a response but it's a lot less than that. Clearly dnscache should implement two timeouts per request: one for sending a second request (to another nameserver) for the same information, and one to give up waiting for a response from the first request. The 2nd timeout should be much longer than the first. If dnscache was modified to wait up to 10 seconds for a response but try each successive nameserver after 1 second, then it should be possible for dnscache to answer the query within 15 seconds, which is reasonable in this context. In these calculations I'm assuming that dnscache has no existing cache (other than the list of root nameservers) because that makes dnscache's behaviour predictable, and it shows us the worst case performance. The next step for me is to work out if dnscache can have multiple outstanding requests to nameservers for the same client request. Obviously dnscache can handle multiple concurrent client requests and must query many different nameservers concurrently, but the question is whether it can query multiple nameservers for the same information, at more or less the same time, and use the first response that is received. You can obtain IPv6 connectivity in Australia using the AARNet IPv6 Migration Broker if your ISP does not already provide IPv6. As at August 2008, only Internode is known to provide consumer level IPv6 access. For Australian users who cannot obtain IPv6 through your ISP, the AARNet IPv6 tunnel is probably the next lowest latency choice. These instructions describe setting up IPv6 with linux over a consumer DSL connection with a dynamic IPv4 address (i.e. every time you connect you get a different IP address) and NAT (Network Address Translation) on the DSL modem. With IPv6 you can get a static address (well, 2^64 or more static addresses) and it's quite useful if you run a home network and want to provide access to devices within the network, from outside. That is, so long as the outside client has IPv6 (the chicken-and-egg problem). Certain assumptions are made in this document - like installed software or an IPv6 enabled kernel. If these instructions don't work for you, drop me an email at nick at nick-andrew.net. You may need to load the "ipv6" module. Check that you have the commands "ip6tables" and "ip". It's good for security to setup the IPv6 firewall before you even start configuring it. Although you may have an IPv4 firewall already in place, that won't stop any IPv6 packets. I'll assume you want to make connections out, but block all connections in, which is the standard functionality you get with NAT, and useful for a client. For a server you will need to allow connections in for the server ports. I use a shell script with a function alias, to set the firewall. doCmd6 -A 6_log_drop -j LOG --log-prefix "ipv6:"
This set of rules will allow you to make outbound IPv6 connections and will block inbound except for ICMP (your address can be pinged) and you can uncomment a line to enable ssh connections in. UDP port 3653 is used by the AARNet tunnel broker. Protocol 41 is used by 6to4 tunneling, which I will describe now. #  Sets up an ipv6 tunnel through the nearest public gateway. #  Automatically learns current ipv4 address. 192.88.99.1 is an address which routes to the nearest public IPv6 gateway. Unfortunately for us Australians, that's probably in the USA. But it's easy to setup, as you can see. This technique has some advantages and disadvantages. On the positive side, you have 2^80 addresses to use. That should be enough for anyone. On the negative side, these addresses are as dynamic as your IPv4 address because they are derived from it. Also, you may be able to make outbound connections but not accept inbound connections, depending on what functionality your DSL modem provides. My DSL modem allows me to open up protocol 41 traffic, but it doesn't provide a configuration option to forward all incoming protocol 41 connections to my linux box. So my box can only accept inbound connections while there's a working outbound connection (this is standard NAT functionality). So 6to4 is a good technique to get started with IPv6 if you want to, say, browse ipv6 websites. But it's not so useful for servers. "ping6" and "telnet" are your friends. www.sixxs.net will show your originating address and protocol at the bottom of the page. You'll need to create a username on the AARNet IPv6 Migration Broker and then associate that username with a tunnel. The "Request Tunnel" CGI hangs for me, I don't know why. I assume it created a tunnel correctly because I'm getting one. Install the "tspc" package. I'm using Debian, so it's just "apt-get install tspc". When Debian installs tspc, it automatically configures it to obtain an anonymous IPv6 tunnel from freenet6.net. Although that's great and easy, it's not what we need in Australia. So after installation, stop the daemon with "/etc/init.d/tspc stop". To be continued ... no time to write the rest of the document today. Note that AARNet assigns a /56 even though this config asks for a /64. AARNet's broker seems a bit flaky. It sometimes ignores the UDP packets so you may need to start the daemon a few times before it connects properly. As I mentioned, the CGI to request a tunnel hangs for me. If it doesn't hang, it may return a shell script, which you can ignore. It's possible you don't even need to use the "Request Tunnel" CGI, maybe it will assign a permanent tunnel when tspc connects for the first time. Also AARNet reboot the server at 03:00 every morning. The tspc daemon will try to reconnect if the tunnel fails, but perhaps not forever. In any case, you want IPv6 to be always available, which means monitoring it. If the tspc daemon stops, you will need to restart it manually. I wrote this simple perl script which just logs whenever IPv6 stops working. It doesn't monitor the process or interface at all (you'd want to monitor the process itself if you change the script to restart a failed process). I just run it like this: "check-ipv6.pl ipv6.l.google.com" and it pings once a minute (on the minute) and logs whenever the calculated state of the IPv6 connectivity changes.